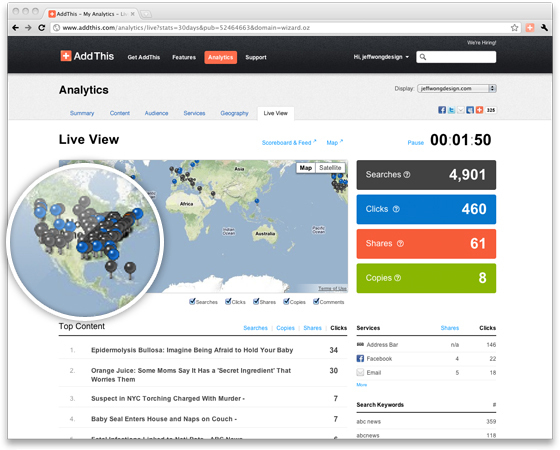 Check out the live analytics we released this morning over on AddThis.com. The whole team worked incredibly hard to consolidate all of the live features that we've been working on separately this year. The result is one report where AddThis publishers and bloggers can watch content trend in real-time, all over the world. We've also introduced several new data types, including search and copied keywords, to help viewers understand what is bringing their audience to their site, what interests them, and what keywords are then taking them away to search, email, IM, etc. Read more in my blog post over on AddThis.com.